Gosh, this book is grim. It starts with the colonel being summoned from his house in the middle of a rainy night to collect the tortured body of his daughter from the secret police, and he is told to bury her before daybreak to avoid any kind of attention. The story of that night and the following day is combined with flashbacks, and we learn of one child after another lost to violence: being tortured by the Shah’s regime or the Islamic Republic, or dying in the Iran/Iraq War. Each of his children belongs to, and represents, a different political movement: different flavours of communism and Islamism. But they all fall foul of the government sooner or later, as the political tides change. Except, I guess, for the one who dies in the war, who is celebrated as a martyr — but is no less dead. I don’t know enough about the politics of Iran in the 70s and 80s, so the historically specific detail is lost on me, but it still works as a portrayal of a country suffering political turmoil and violent repression. Certainly an effective novel, if not an enjoyable one. 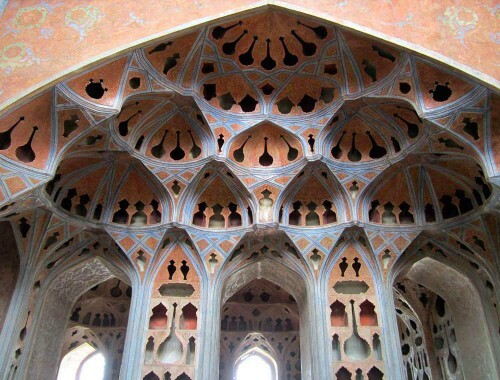 » The photo is of ‘the acoustic ceiling of the rooftop music room of the Ali Qapu Palace in Isfahan, Iran’. Not particularly thematically apt, but it’s a nice picture. © David Stanley and used under a CC-by licence.